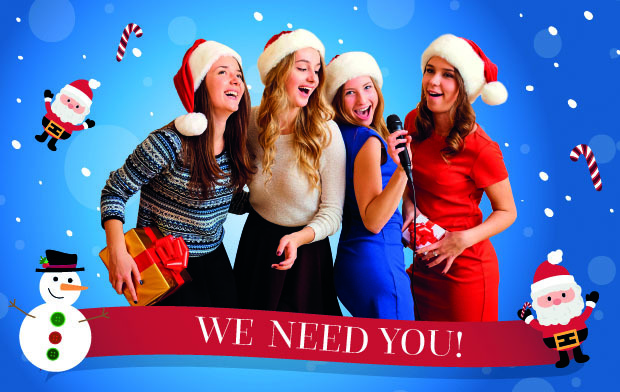 The Liberty Shopping Centre in Romford will attempt to gather the largest choir of ‘Carols’ singing Christmas carols on Saturday 25th November, with one lucky ‘Carol’ winning a £1,000 donation for a chosen charity. The Liberty Shopping Centre is set to kick start the festive season with an attempt to create a brand new world record – the most ‘Carols’ singing Christmas carols together. Lead by singer and musical director, Rebecca Amissah, who recently performed on Sky One show Sing: Ultimate A Capella hosted by Cat Deeley, the ‘Calling all Carols’ record attempt will take place at 4pm on Saturday 25th November underneath the centre’s Christmas tree. Every participating Carol will be entered into a prize draw for two fantastic prizes – a donation of £1,000 for a charity of the lucky Carol’s choice and a £250 gift card for The Liberty. The centre is encouraging people with all variants of the name ‘Carol’ to take part, so Carolines, Karolinas, Carolyns and people with Carol in their middle and last names can also get involved. Centre manager, Jonathan Poole, said: “We’re really excited to kick start Christmas with our attempt to create a new record and also the opportunity to reward a worthwhile local charity or community organisation. Registration will open at 2pm on Saturday 25th November behind Starbucks, opposite Linzi shoes. No previous singing experience is required and participants will simply need to collect and fill in a prize draw form and hand to a member of staff along with a photocopy of a form of identification which shows that ‘Carol’ or any variation appears in their name. Carols will be asked to gather at the meeting point under the Christmas Tree for 3:45pm, when they will take centre stage with Rebecca Amissah, who will lead a vocal warm up. From 4pm the ‘Choir of Carols’ will sing popular Christmas carols for which word sheets will be provided. The prize draw will take place at 4:30pm with one lucky Carol receiving £1,000 for a chosen charity and another lucky Carol receiving a £250 gift card to spend in The Liberty. To be eligible for the prize draw all Carols must have registered and be present for the draw. Come on Carols, it’s your time to shine! Sign up now.